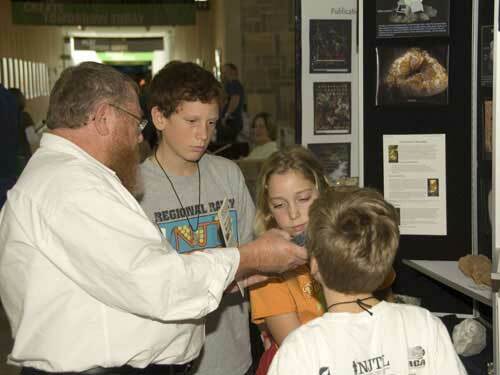 earth other than meteorites," said Nelson R. Shaffer Ph.D.
door to get a closer look at his display cases and slides of meteorites. "Look for a thin dark coating. It can be glassy or dull," he said. "They're usually heavy because they're made of metal." Indiana Geological Survey and is an expert in mineralogy and meteorites. 90 percent are stones while 5-6 percent are iron. "We get a lot of meteor-wrongs as well," he joked. some meteorites selling for millions of dollars, Shaffer said. meteorite falls or finds in Indiana. his collection of space debris. "I just like meteorites" he said, with a smile. from curious students and to display his collection.